Above the third Artha Maandapam is a small "Open Enclosure" but of smaller width unlike the Artha Mandapam at the other levels, but with another doorway in front also facing in the same eastern direction, and two side slotted stone windows, but with no Maha Mandapam or Open Terrace in front of same. This enclosure terrace is in front of the Dakkshina Meru Vidandakar Stone Panel on the Vimanam. There should have been an approach stairway to this open enclosure terrace area too and possibly the daily religious rituals was also done to the Dakkshina Meru Vidandakar on the Stone Panel on the east face of the Vimanam. On all the top edge walls of the third Mahamandapam possibly was decorated with equi-spaced Nandi all right round. We even on the short width side walls on the forth level enclosure with final finish has three small Nandis on them. These damaged and dismanled Mahamandapams on the first level and second level would have been with stone windows all around for ventilation as seen in the existing ground floor Mahamantapam. From the three levels of Arthamandapam there are doorway on the western side too leading in the the Karuvarai of the temple. At the third level Artha Mandapam which is reached from the second level Arthamandapam by a stairway within second level Mahamandapam.the There appears to be another doorway at this level on the Karuvarai side which is possibly a corridor right round the base of the joint level Karuvarai and the start of the Vimanam over it. The Mukha Mandapam is located in front of the Maha Mandapam with two stairway going downwards on the either sides of the Mukha Mandapam. There is no Stairway in front of the Mukha Mandapam at Gangaokonda Choleswarer temple like at Rajarajaeswarem temple at Thanjavur. Further there had been a Roofing Shelter over the Mukha Mandapam as in the latter temple which is now fully destroyed, which is further confirmed by two carved pillers standing at the end the wall with a wide opening in front, enabling a view of the inside of the Mukha Mandapam from the outside of the temple. Closer to the northern main entrance stairway leading to the outside from the ground level Artha Mantapam of the big temple, is the seperate small temple shrine to Lord Chandeswarer. There exists the small Nanthi of granite in the Muka Mandapam (with roofing shelter fully destroyed) of Gangaikonda Choleswarer temple with two stairways going downwards on either sides - outside the main entrance to Mahamandapam with two Dwarapalas on both sides. There is a big Nanthi of Standstone outside and in front of the Muka Mandapam which is of a latter period construction. None of them seems to be the "original main granite Nanthi" of Gangaikonda Choleswarer temple, as the granite Nanthi is comparitively very smaller than the original Nanthi of the Rajarajeswarem temple at Thanjavur. The "original main granite Nanthi" of Gangaikonda Choleswarer temple should have been of the same height and size of the latter Nanthi or bigger. (See Images below). It could possibilty be that the "main granite Nanthi" of Gangaikonda Choleswarer was destroyed in war or carried away as a war victory monument and lost to us today. The existing big Nanthi of Sandstone was erected during the period of rule of the Vijayanagara kings (of Karnataka) over this region. There is an inscription built into the platform of Nanthi of Sandstone, refering to a grant provided for a Sandi lamp. Surrounding the main temple structure comprising of 'Karuvarai with Vimanam', Maha Mantapam and Muha Mantapam all in integral, is a vast Katthala Velimuttram (Stone-paved Outeryard) within the Thiruchchuttru Maalikai. On the order of the emperor Rajaraja Chola, the single floor enclosure cloister (thiru-chuttru-maaligai) which surrounds the Rajarajaeswarem temple was caused to be built by his general (Senathipati) Sri-Krishnan Raman alias Mummudi-Chola-Brahma-Marayan.. This connects to the second Gopuram from the main entrance being called as the Rajarajan Thiruvaayil. The Thiruchchuttru Maalikai going all round the Katthala Velimuttram measures internally 500 ft length and 250 ft width and externally 800 ft length and 400 ft width. The entire cross section of this Thirucchuttru Maalikai comprises of an long Ullaalai (Inner Corridor) of single Tier, with an integral outer Wall having a height over the Ulaalai upto 28 ft.
On the top four corners of the Thiruchchuttru Maalikai integral Wall there are four Sikarams, and inbetween these Sikarams along the top perimeter of the Wall, are the equi-spaced same size Nanthis to be seen. Within the Ullaalai of the Thiruchchuttru Malikai there were some smaller Shrines of the Parivaara Theivangkal (accompanying Deities). There was only one Gopura Vaayil (main entrances) at the Gangaikonda Choliswarer temple. This Vaayil had an ornate Gopuram of ..... ft height in three tiers. This connects on both sides to the Thiruchchuttru Maalikai and Puramathil going right round the temple. The Thiruchuttru Maalikai Puramathil had small eqi-spaced Nanthis all round on the top of the Puramathil with ornate minor Gopurams at the four corners, like the Puramathil at the Rajarajeswarem temple at Thanjavur. This Puramathil on all four sides were named as "Rajendra Cholan Thirumathil". In the above Video it is mentioned that we have "only one" Inscription found at Gangaikonda Choleswarem Temple, and that too is of Rajadhiraja Chola - 1, 'which is totally incorrect'. There are no Inscriptions belonging to Rajadhiraja Chola -1 is to be found at Gangaikonda Choleswarem Temple. However in the first and lengthiest Inscription engraved at this temple in the year A.D 1068 of Virarajendra Chola includes the details of the earlier endowments made to the Gangaikonda Cholapuram Temple by his "father" Rajendra Chola - 1 refered to as "Purvadesamum, Gangaiyum, Kadaramum kondarulina Iyyer" in the year A.D.1035 and A.D.1036 and his "elder brother" Rajadhiraja Chola - 1 refered to as "Kalyanapuramum Kollapuramum kondarulina Anai mel thunjina Annar" in the year A.D.1044 and A.D.1048. It also enumerates the endowments made to this temple by Virarajendra Chola himself in the year A.D.1068. Further we are aware that around twenty Inscriptions have been discovered on the main temple on it's outer walls of the Karuvarai, Mahamandapam and Mukhamandapam and further nineteen Inscriptions of other kings in the subshrine of Durga and other minor buildings within the complex and on broken slabs found in the second Pirakara within the Temple, and one on it's Eastern Gopuram as at today. Further an oversight error in this Video in respect of the period of rule by Rajendra Chola - 1 too should be corrected to be as A.D.1012 - 1044, instead of A.D.1012 - 1014. There had been many Scholars (T.N.Subramanian, Dr R.Nagaswamy, Dr T.V.Mahalingam, Dr Kudavayil Balasubramanian, Dr L.Thyagarajan, and Dr Pierre Pichard) who have ventured in the study of the Inscriptions at Gangaikonda Cholaeswarem Temple, in the other Shrines and on broken Slabs lying within this Temple Complex. The best indepth research that has been made in the study of these Inscriptions is that by the Scholar - Dr Daud Ali of University of Pensilveniya, USA" who visited Tamil Nadu and had made a "research study" and written a book titled as "The Epigraphical Legacy at Gangaikondacholapuram: Problems and Possibilities" which is the currently the "most informative book" on all Inscriptions that had been copied 'up to now' at Gangaikonda Cholaeswarem Temple complex at Gangaikonda Cholapuram in Ariyalur district, Tamil Nadu. I with much courtesy to him, extracting only the details of these 39 - Inscriptions with the valuable Informations available on them, which includes many recently discovered Inscriptions which have still not been officially published in the South Indian Inscription Journals and not known to many as given in his Book (pages 21-26), and a Diagram (Page 19) showing the actual locations of these Inscriptions in this Temple which have been verified and confirmed by him - are appended below in his own words. My very sincere gratitude to him for the valuable services he has done in this connectiom - which is a great asset to the Historical Community of Tamil Nadu, and to the upcoming Students in the study of Epigraphy of Tamil Nadu. Before venturing into the study of these 39 - Inscriptions, it should be noted that there had been another Inscription on the "Vimaana" (tower over Garbagraha) of the Gangaikonda Choliswarem Temple (making a total of 40 - Inscriptions) noted by T.N.Subramanian (South Indian Temple Inscriptions Vol 1, Page 678), which has still not been re-traced by the subsequent ASI Surveyors and it's actual location confirmed. Trust some enthusiastic young Researchers will take an initiative to locate same on the Vimaana and publish informations on same. The text of the fragmental Inscription said to be on the Vimana is as follows: "suba sri racentira cola tevarkku yantu.....mahesura raksha". In my view it doesnot appear as a fragment of an Inscription, but an epitome on Rajendra Chola - 1 engraved on the Vimana of the great temple built by him to God Siva meaning "the blessings of Maheshwara (God Siva) 'be with' ('yaantu') prosperous Sri Rajendra Chola Thevar". https://scontent.fcmb1-1.fna.fbcdn.n...4d&oe=5A287F58 The first Photo-Image has a thin horizontal stone slab below Chandikeswara (or Rajendra Chola - 1 ????) Stone-Image has this piece of Inscription which is enlarged and shown in the second Photo-Image below. From the Hottur Inscription of Rajendra Chola - 1 (Epigraphia Indica - XVI, Page 74) we note Rajendra Chola was known as "Rajendra Vidyadhara". Is this short Inscription is referring to the so-called Chandikeswara Image as that of Rajendra Chola - 1 - to be verified. relating to a number of villages assigned as tevatana to the temple of Gangaikondacholiswarem. essary entries were madein tax registers regarding these villages by a number of King's officers. Minute details of the assessment of all the assigned villagesare given in the Inscription. "pukal culnta" and followed after the date by two verses of a Gahadvala prasasti. Details - Beginning of each line lost. Commences with the poetic introduction beggining pukalmatu vilanka. Records gift by thr king of land as devatana-iraiyili in Cungatavirnta-colanallur to a temple of Rajendra Chola Isvaramudaiyar at pottali matam. the gift was made by the king while he was in his palace at Gangaikondacholapuram on a petition made by a ascetic (tapasi0 of the temple that the services were at a standstill for want of endowments. Details - Incomplete. Records the sale of lands belonging to number of individuals to temple Gangaikondacholisvaram. Details - -Registers gift of 20 veli of land by the king for a special service called Rajakkanayan-Sandi instituted after the name of the king as tax free land to the temple authorities of the temple of -Udaiyar at Gangaikontacolapuram in Mannaikontacola-valanadu in Vikramacolavalanatu..."
Details - Damaged. Records the gift of the Chief Tiruvenkatamudaiyan mentioned in No: 10 below. may have been a subordinate of Vijayanagara king. Details - Damaged. Mentions one Thiruvenkatamutaiyan Ekamrannatha Gangeyan of Vaippur, a chief who seems to have been in control of this area at the end of fifteenth century. Details - much damaged; mentions Devaraya once and mallikarujunaraya twice. Publication - Unpublished ARE 83 of 1908. Location (confirmation) - Built onto the southern steps of the platform abutting the central shrine of the main temple. Details - Fragmentary. Contains portions of the meykkirti beginning pumevalar... Seems to record grant of land for the procession of the deity during festival. Mentions the names of few mechants such as Tillaiyal(i) ati vitantakan etc and refers to Karikalasolacaturvedimangalam and a devadana iraiyili. Location (confirmation) - Fragments built into the padma forming the base of the same platform of the mahamandapa of the main shrine. Details - Damaged, with beginning lines lost. Commences with the eulogistic introduction puyal vayttu, indicating it is probably dated to the reign of Kulottunka - 3. Refers to a royal writ and an installation in the temple. Mentions Virudarajabhayanka valanatu and Merkal - [natu]. Location (confirmation) - On the mahamandapa, east wall, outer tier, on kumuda of northeast corner of mahamandapa. Publication - Unpublished ARE 319 of 1965. Details - Fragment. containing a portion of the historical introduction of the king. Location (confirmation) - On the north wall of the mandapa in front of the central shrine. Dynasty - [Chola] characters of twelfth century. Details - Fragmentary. Seems to record a grant for two Sandi lams. Location (confirmation) - Stones built into the southernsteps of the platfor abutting the central shrine of the main temple. Publication - Unpublished ARE 324 of 1965. Details - End of each line mutilated. Location (confirmation) - On the eastern wall of the mahamandapa. Details - Very damaged. Records an agreement between some temple the nattar and the (tandirimar) of Paraiyur-natu and sthanattar in the temple of Gangaikondacholisvaram-utaiya-nayanar regarding some temple lands. Location (confirmation) - North wall of mahamandapa close to central shrine. Located. misdescribed in ARE Report. Details - Contains two Sanskrit verses in the wherein the conquest of a fort, victory over the Pandiya and setting up of a pillar of a victory are mentioned. Details - Records the donation of flywhisks to the deity made with an amount of pon of 8 mari weighed by Koyilankadik-kal by Ammankaiyalvar, daughter of Colatever and one flywhisk made with 20 pon of 8 mari weighed by the same stone by Pukaliyalvar, daughter of vanavan Mateviyalvar. Location (confirmation) - Tiers on the east wall on the entrance to mukamandapa. Details - beggining lines lost and incomplete. Commences with puyal vayttu. Seems to record gift of 482 kalanchu by Tuntanatutaiyan Ekavaccakan kulottunkar, son of Candramauliyavar for some purpose in the name of latter, who appears to bear some relationship to Sungantavirttarulina Kulottunkacola. Details - fragmentary . one of the fragments refers to an undertaking given by an individual after receiving five kacu, and another mentions Mkulam utaiyan and Tiruccirrampalam Utaiyan, and a third to a land not fit for ultivation of paddy. Details - Registers order of king relating to emoluments of a temple servent. Details - Fragmentary. Refers to a Gangavilandarapuravaradhisvaran. In late characters. Location (confirmation) - Fragment built into the base of the left platform of the muhamandapa of the main shrine. Details - Fragmentary. Seems to record grant for a Sandhi lamp. Publication - Unpublished. ARE 318 of 1965. (28) King/Date - --------- , ------ (------ AD) (In my view on a close study of the three Inscription Nos: 13, 28 and 29 put together it is noted that this Inscription belongs to the period of Adirajendra). Details - Fragmentary. Seems to be parts of a record registering gifts of gold by persons including female servents (anukkiyar and pentatti) of the Tirumancanattar velam. Also refers to "Tribhuvanamatevip Perunkati"
Location (confirmation) - Fragments built into the right side doorjamb of the entrance to the Durga shrine. Details - Fragmentary. Seems to record a gift by Marutan Civakkoluntu (a pentatti). Also refers to two merchantsof the perankati, Kuttan Adivitankan who was charged to contribute interest out of the gift and Tutuvan...who stood as suretyfor the former. Location (confirmation) - Fragment built into the baseof the wall of the office of Executive officer of the temple. Details - Records that the pillar was donated tapillai-puttanayakan the kilan of Palaiyaru. In charactors of the 12th century. Location (confirmation) - On a stray pillar near the Executive office of the temple. Location (confirmation) - Fragment built into the wall of between the houses of the Executive officer and temple priest. Details - Fragmentary. Records that the palakaipatai probably for Kuttatuntevar (Siva as Dancer) in the temple was caused to be made by Sembikulamanikkattar, an anukkiyar (close female attendent) of the king. Publication - Unpublished ARE 328 of 1965. Details - Fragmentary. lists various gifts like a lamp, two cows fir it's maintainenceand gold for some ornaments. 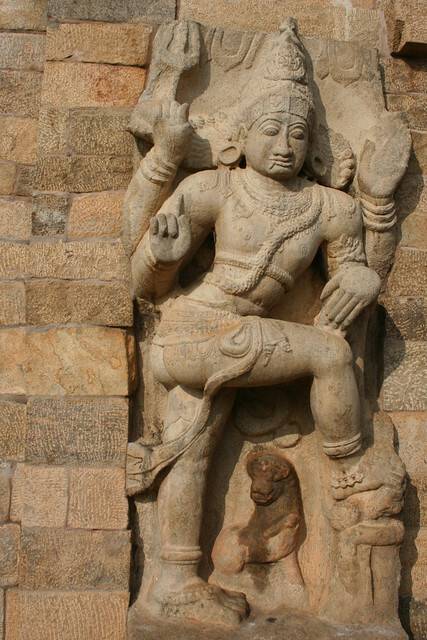 Location (confirmation) - Another in the sidewall of the entrance of the gopuram of the temple. Details - Fragment. Damaged and complete. Refers to the sluice of the lake in Gangaikkondacholapuram of Kidarangondacholavalanadu. Location (confirmation) - On loose stone pieces kept inthe temple precincts. Details - Fragment. Damaged and incomplete. Refers to the gift of money 9narkacu0 by a lady, one Tribhuvanamudaiyal with the interest amount of a sandhi lamp was to be maintaiined by temple authorities. Location (confirmation) - On loose stones pieces kept in the temple premises. Publication - Unpublished ARE 525 of 1994. Details - Fragment. Damaged and incomplete. Refers to the accession of land and mentions puppadai of Gangaikondacholapuram of Kidarangondacholavalanadu. Location (confirmation) - On loose stone pieces keptin the temple precincts. Publication - Unpublished ARE 526 of 1994. Location (confirmation) - On loose stone pieces kept in the temple precincts. Details - Fragment. Damaged and incomplete. Records donation of a doorframe 9thirunilaikkal0 by one madhava-chetti and his wife 9akampatiyal). In characters of the 12th century. Details - Fragment. Badly damaged. Purport not clear. Further there are also some Inscriptions visible even today at the Lower Anicut (Dam) built across Kollidam River, as the British Engineer Arthur Cotton who built same in A.D.1836 used many dismantled granite stones from the Gangaikonda Cholapuram Temple and it's other Structures. These visible Tamil Inscriptions on the Stones and Carved Pillars used to build these Dam Walls should be transcribed and documented long before they are lost to us forever - by enthusiastic young Epigraphists of Tamil Nadu - from the Low Anicut (Dam) over Kollidam. . The Saivite Sage "Karuvur Thevar" of the period of Rajaraja Cholan - 1 and Rajendra Cholan - 1 has sung 'Thiruvisaippaa' (Hyms) on these two great Siva Temples, which have now been included in the nineth Thirumurai of the twelve - Tamil Saiva Thirumuraikal. Under the rule of the Mugal Emperor of Delhi namely Aurangazib, his 'Military General; Allaudin Kilji invaded South India and Tamil Nadu around A.D.1310. In Tamil Nadu he raided and pillaged the Gangaikonda Cholapuram Temple a masterpiece of "Tamilian Architecture" and carried away all it's wealth. In the year A.D.1756 the French forces who gained grounds in Tamil Nadu around Pondichery invaded the Udayar Palayam and sucessfully captured that region to themselves. Nine years later in A.D.1765 the Nawab of Arcot invaded Udaiyaarpaalaiyam with the help of English Forces - who too have gained grounds at St George Fort region over French. During these two wars the Gangaikonda Cholapuram Temple which served as their bastions suffered much damage. However in the year A.D.1817 this temple and the region of Udaiyaar Paalaiyam was restored back to it's legitimate Ruler the Chieftain Kaalaatkal Chola Udaiyaar, who agreed to pay tributes to the English.